Eillien’s Candies Inc. is voluntarily recalling some of its candy items for having undeclared allergens. 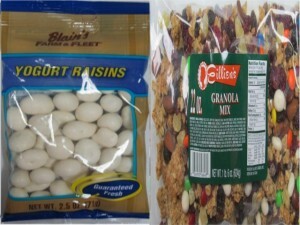 The recalled products are yogurt raisins and granola mix. The recalled candy items are believed to contain yogurt-covered peanuts that are not indicated on the products’ packaging. It was found that yogurt-covered peanuts had been accidentally mixed with the yogurt-covered raisins. Peanuts (in any form) are considered a common food allergen. Persons who have hypersensitive reactions to them might experience an allergy attack upon consumption of the recalled product. Currently, there have been no reports of allergy attacks that have traced back to the recalled candy items. “Mill’s Fleet Farm Granola Mix” – packed in 1-lb and 8-ounce containers with a UPC of 34952-56647. These products were distributed in retail stores in the areas of Wisconsin, Iowa, Michigan, South Dakota, Colorado, Illinois, Minnesota, North Dakota and Nebraska. Consumers who may have purchased any of the recalled products are advised to return it to the store, or call Eillien’s at 920-336-7549.